The National Yacht Club has an active Topper Fleet with sailors participating in training and events throughout the year. The Topper is a true one design dinghy, ideal for all levels of racing from the novice to international sailors, because it is light, robust yet simple and easily managed by younger sailors. With two alternative rigs, the 5.3 is ideal for sailors in the 40-60kg weight range and approximately 140cm to 170cm in height. The 4.2 is perfect for sailors in the 28-45kg weight range. Sailors vary in age from 10 to 18, with the vast majority in the 14 to 16 age groups. For those looking to try out a Topper why not come along to one of the regular training events and see why it is known as the “The Friendly Class”. For 2018 we have a great programme of sailing for Toppers, both in NYC and at away events throughout the Country, and particularly exciting for this year is the Topper World Championships in China which some of our NYC sailors will be attending. Training will take place throughout the year preparing sailors for local competitions such as the Friday Night Series or the Summer Regattas. For those that are a bit more competitive there are Performance Clinics during the autumn and spring to prepare sailors for the Topper Traveller and National/ Regional Events which will take place between March and September each year. The National Yacht Club has an active Topper Fleet with sailors participating in training and events throughout the year. The Topper is a true one design dinghy, ideal for all levels of racing from the novice to international sailors, because it is light, robust yet simple and easily managed by younger sailors. With two alternative rigs, the 5.3 is ideal for sailors in the 40-60kg weight range and approximately 140cm to 170cm in height. The 4.2 is perfect for sailors in the 28-45kg weight range. Sailors vary in age from 10 to 18, with the vast majority in the 14 to 16 age groups. For those looking to try out a Topper why not come along to one of the regular training events and see why it is known as the “The Friendly Class”. For 2018 we have a great programme of sailing for Toppers, both in NYC and at away events throughout the Country, and particularly exciting for this year is the Topper World Championships in China which some of our NYC sailors will be attending. 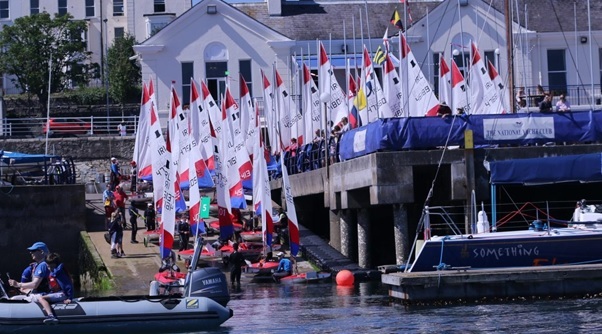 Training will take place throughout the year preparing sailors for local competitions such as the Friday Night Series or the Summer Regattas.